Star designer Kyle Schuneman offers bold ideas for achieving big style in small spaces—on any budget. A first apartment allows you to finally do what you want with your own space, but it can be tricky to decorate. Luckily, twenty-seven-year-old decorating prodigy Kyle Schuneman knows that a paper-thin wallet and four plain walls don’t have to stand in your way, and the ten amazing, real apartments in this book show it. Kyle’s creative solutions reveal how you can make your space feel much larger than it really is—and how it can reflect your passions, your travels, and your location. He will inspire you to use your surroundings for decorating ideas (think taxi-cab-yellow accents in New York or graffiti-like dip-dye curtains in Seattle). Short on time and long on style, the thirty DIY projects here include no-sew pillows and a dresser update using a little glue and decorative paper. 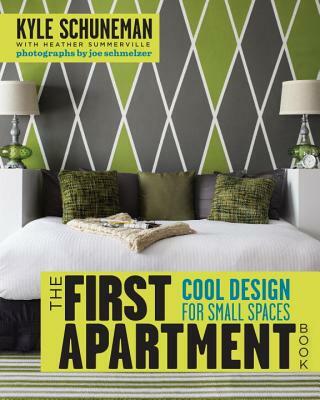 Full of bold, vibrant photos, an extensive resource section, and hundreds of big ideas for small spaces, this book proves that there are no limits on how spacious and how cool your first apartment can feel. KYLE SCHUNEMAN is the founder of Live Well Designs in LA. He has been featured in Real Simple, Esquire, This Old House, Sunset, and L’Uomo Vogue and has frequently appeared on NBC and HGTV. Named one of House Beautiful’s “Next Wave of Top 20 Designers,” Kyle is the art director for the Emmy Award–winning Giada at Home on the Food Network. This is his first book. A former senior editor for Lucky magazine, coauthor HEATHER SUMMERVILLE has written for InStyle, Travel + Leisure, and Real Simple. Photographer JOE SCHMELZER’s work has been featured in Elle Décor, Coastal Living, and House Beautiful.